President Barack Obama said Thursday his history-making visit to Cuba next month was part of an effort to “improve the lives of the Cuban people.” He vowed to press the communist government on human rights and other policy differences. “We still have differences with the Cuban government that I will raise directly. America will always stand for human rights around the world,” Obama wrote, as he announced the visit on Twitter. Rhodes noted the ultimate aim is to persuade Congress to lift the trade embargo — an unlikely possibility in the near term. In addition to meeting with Castro, Obama will interact with members of Cuban “civil society,” the White House said, referring to activists that advocate for various social causes. Prior to announcing the trip, Obama had said one of the conditions for a presidential visit would be the ability for him to speak to all kinds of groups — including those that oppose the Castro government. Obama’s stop in Cuba will be part of a broader trip to Latin America that the president will take next month. 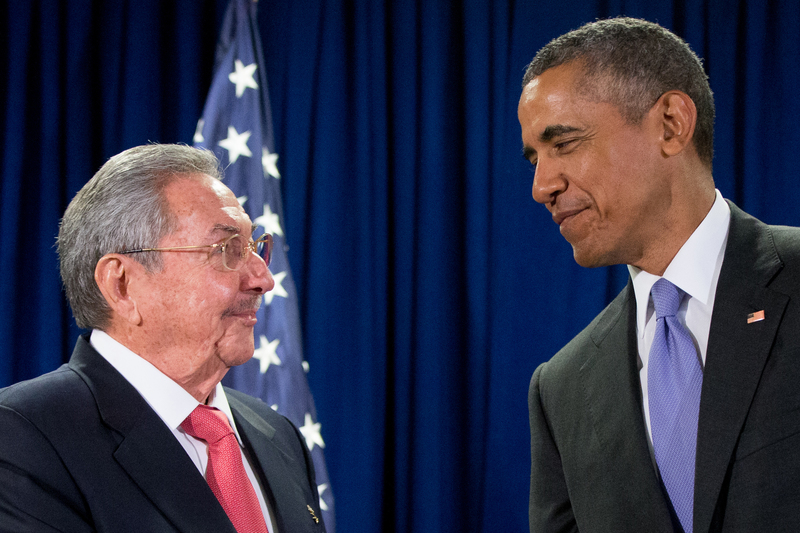 From Cuba, Obama will travel to Argentina, where he’ll meet with the new president. But Obama, facing steadfast opposition to normalized relations from Republicans and some Democrats, has been unable to deliver on the former Cold War foe’s biggest request: the lifting of the U.S. economic embargo. Opponents argue that repealing those sanctions would reward a government still engaging in human rights abuses and stifling democratic aspirations. Obama and supporters of the detente argue the decades-old embargo has failed to bring about desired change on the island 90 miles south of Florida. Still, while Obama has long expressed an interest in visiting Cuba, White House officials had said the visit wouldn’t occur unless and until the conditions were right. Officials didn’t immediately specify what had changed in the last few weeks to clear the way for the trip, first reported by ABC News. But on Tuesday, the two nations signed a deal restoring commercial air traffic as early as later this year, eliminating a key barrier to unfettered travel that isolated Cuban-Americans from their families for generations. Hundreds of thousands more Americans are expected to visit Cuba per year under the deal, which cleared the way for the Transportation Department to open bidding by American air carriers on as many as 110 flights a day. Currently, there are about one-fifth as many flights operating between the two countries — all charters. According to the State Department historian’s office, President Harry Truman visited the U.S.-controlled Guantanamo Bay and its naval base on the southeast end of the island in 1948 and former President Jimmy Carter has paid multiple visits to the island since leaving office in January 1981. Not since President Calvin Coolidge went to Havana in January 1928 has a sitting U.S. president been to that city.